I'd say this is a nice find...looking through some old cardboard boxes in my basement, I came across some of my older brother's stuff. 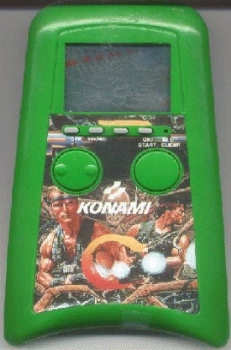 According to the print stamped into the plastic, Konami churned it out in 1989, and it takes two "AA" batteries. It's about 6½ inches long and 4 inches wide, so it'll fit into a back pocket. You play as either Scorpion or Mad Dog (obviously), but it's kinda hard to tell who. There's four "channels" you can move along, using the left–right button on the left. On the right, there's the fire button. You shoot robots and what looks like a one-footed monster from Doom 2. OK, so the enemies aren't right on. The game itself is pretty fun, and you score 10 points per enemy killed. 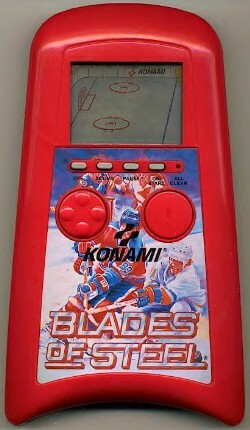 It'll keep track of your high score until you take out the batteries and has a button to toggle the sound on and off. The sounds resemble the real NES game closely. Oh, and the "Playing" WAV is a bit noisy, I'm punching the buttons and the game keeps hitting the microphone. Heh. Well, well, well. 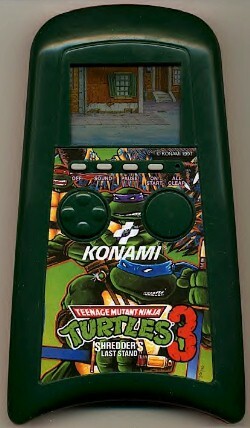 ILOVETANG sent in these pics of the handhelds that he owned. I can't really give any info on them, obviously because I don't own them.